Back in the spring of 2011, I moved up to Clare County. I was without a wife, family, friends, job, future, purpose, church and some of my eyesight. All I had (or felt I had) was a place to hang my hat back in a place back in the woods near the town of Harrison. My ex and I had bought the place during better times. This was not one of them. 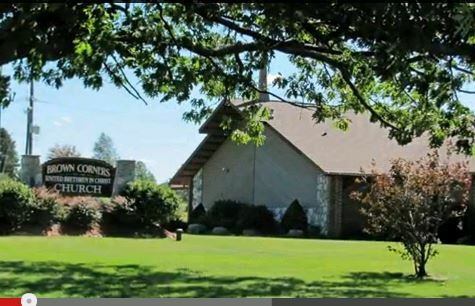 Brown Corners United Brethren Church, its people and its ministry helped me put my life back together. I became acquainted with Brown Corners when I started attending a program called Divorce Care run by a wonderful couple named Bruce and Cindy Mackie. I got to know Bruce pretty well as the 13-week program went on and enjoyed his advice and friendship. I also found the program well worth while and highly recommend it. Based on my experience and the people I met at the divorce program, I decided to take a chance and attend a Sunday morning service at Brown Corners. Now I didn’t know anything about United Brethren in Christ faith at the time. I basically equated the church with Mennonites and the Amish that were in the area, and so expected a service of old hymns played on old, off-key organ. Man, was I ever surprised. Turns out among other things, Brown Corners has a knock-your-socks-off with a 10- to 15-member praise band playing professional quality contemporary music. Not only that, but each Sunday I attended, their music leader Scott seemed to pick songs that spoke to me; that reached deep within me and fed me. In addition, I found Brown Corners offered a number of wonderful Sunday School classes and other programs geared for people of all ages and of all faith maturities. And it is filled with great people who, in time, became my friends and still are. 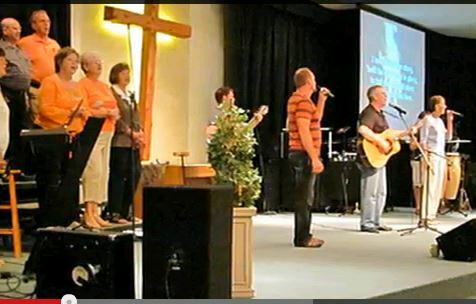 The church itself is led by a personable, self-effacing senior pastor by the name of Chuck Malson. Pastor Chuck as he is called, is also a very good bow hunter. He’s also a man after God’s own heart and adheres to the inerrancy of the Bible; the divinity of Christ and the need for people to repent and be saved. He also believes that no renovation, expansion or program should begin without plenty of prayer and unless funding is secured before starting. It’s a philosophy that has served him well over the 32 years he’s been at the church, which has grown to more than 400 members (large for a rural county). 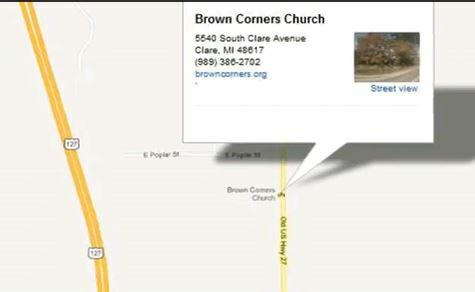 Brown Corners has now established a satellite church in Harrison simply called “20-20Church.” The name is derived from the church’s purpose of giving people a fresh way of looking at God. 20-20 Church seeks to have the same “DNA” as Brown Corners. That is, it seeks to import what has made Brown Corners successful: a similar musical style with a live high quality contemporary praise band. (Although the band might be smaller than Browns, its members are no less talented or committed.) It also includes the pastor who makes the trip to 20-20 to preach between services at Brown Corners. While Pastor Chuck is the church pastor, Bruce Mackie, who I met at the divorce program a couple of years ago, serves as the resident or campus pastor. Pastors Chuck and Bruce are not alone in their commitment. In fact, they are two of many at 20-20 committed to the success of the satellite. For example, each Saturday evening 10-15 volunteers gather at the Hayes Community Center, just north of Wilson State Park where the service is held to set up an eight-piece stage, backdrops and lighting. Then after the Sunday service, a group tears everything down and puts it away until the following week. I attend Brown Corners and 20-20 when I am in the North Country. I help set up 20-20 on Saturday evening, attend the first 20 minutes of the 8:30 Brown Corners service on Sunday morning and then scoot up to Harrison to attend the entire 9:30 service. I then help with teardown. If you are ever up in Clare or Harrison, give Brown Corners or 20-20 a try. It may not change you—not right off the bat–but it will get your toes a-tapping to a Christian beat and that’s a start. P.S. 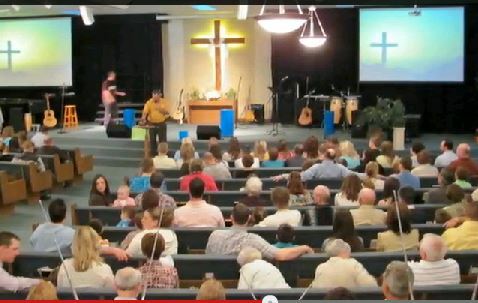 If you go to the home page of Brown Corners and click on the video slideshow, I did that using an audio CD the church was already using. I just felt they needed a video. I thought it turned out well.